Gnisis was about as close to a big town as could be found in the northwestern area of Vvardenfell. It offered many of the comforts of home for city-dwellers on their first trip into the wilds. The town was built on a small plane on a hillside, below a large eggmine. There was a Tribunal Temple, home of the Ash Mask of Vivec, and one of the stops on the Pilgrimages of the Seven Graces. Oddly enough, there was a tiny Imperial fort as well, the northernmost in all of Vvardenfell. Little more than a wall built into a steep hillside, Fort Darius housed an Imperial Cult altar, Legion smith and troop barracks, but most of the actual fort functions took place either in the town tavern, or in a neighboring Redoran building rented by the Imperial Legion. Both Imperial Cult and Legion in this place were largely staffed by Orcs, although Commander Darius is an Imperial and the town population was mainly Dunmer. Late in the Third Era, the Talos Cult, a cult devoted to service to Tiber Septim as one of the Nine Divines, was found to be plotting the assassination of Emperor Uriel Septim VII during his planned visit to the Gnisis area, as part of a plot to place a stronger emperor on the throne. 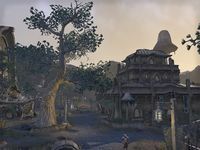 The town also contained an ancient Velothi tower, Arvs-Drelen, which predated the town and served as home to one of Gnisis' most notable personages, the Telvanni mage Baladas Demnevanni, who also predated the town. Gnisis was destroyed along with most settlements in Vvardenfell in the Red Year. Blacklight was taking care of the only survivor of the destruction at Gnisis, Neria Relethyl, and her experience would later be documented. It seems likely that Baladas Demnevanni was among the dead, although the destruction was so complete that evidence is understandably scanty. They New Gnisis Cornerclub in the Gray Quarter of Windhelm was later named after the town. This page was last modified on 24 February 2019, at 05:06.